As the demand for bioproducts changes so does the need for a highly skilled workforce. Finding just the right mix of instruction, hands-on experience, and real-world application is the focus of the Plant Operations program at Walla Walla Community College (WWCC), which is administered in partnership with the Agriculture Center of Excellence. Launched in the fall of 2013, the program prepares plant operators, processing technicians, and maintenance mechanics to work in facilities converting biomass into electricity, heat, transportation fuels, clean water, and high-value chemicals and products. Careers in other allied areas include solid waste management, wastewater treatment, and processing agriculture and forestry materials. 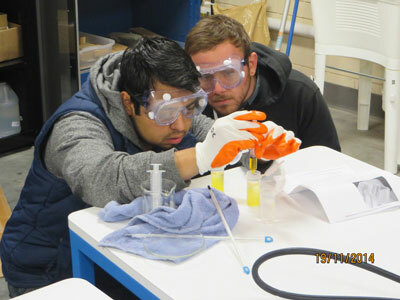 Diego Cruz and Tyler Green testing the conversion of triglycerides (canola/camelina oil blend) to fatty acid methyl esters (biodiesel). In this two-year applied associate’s degree program, students also manage steam, anaerobic digestion, and wastewater systems. Industry representatives, through on-site tours and guest lectures, regularly speak to classes about site permitting, inspections, air quality regulations, and monitoring. Green has taken an array of classes including industrial safety in the workplace, bioenergy, electricity, and water issues and completed an internship at the Kennewick Wastewater Treatment Plant. Students are required to do a minimum ten-week summer cooperative work experience in-between their first and second year in the program. Field trips interspersed throughout the courses allow close observation of mechanical components including digital control systems, heat exchangers, and processing vessels. Numerous opportunities to interact with managers, plant operators, lab personnel, and maintenance mechanics are incorporated into the curriculum. Sarah Nye recording the temperature of a water sample to calibrate thermometers. 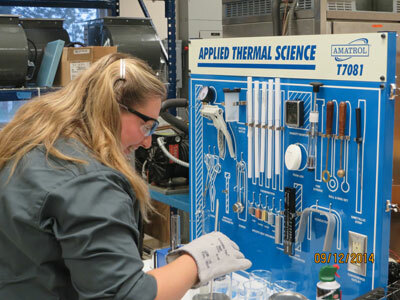 The Plant Operations program is launching a summer intensive, hands-on workshop series over four weeks for incumbent workers, university engineering students, and prospective WWCC students. Topics include biodiesel, steam systems, process level and flow control, fermentation, and pyrolysis.